Investigators “90 percent sure” bomb blew up Russian plane in Egypt. 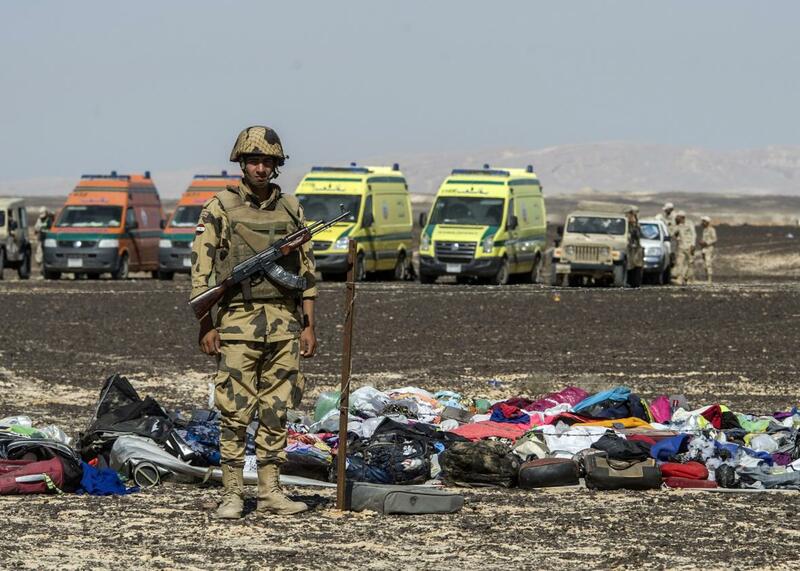 An Egyptian army soldier stands guard next to the luggage and belongings of passengers of the A321 Russian airliner piled up at the site of the crash in Wadi al-Zolomat, a mountainous area in Egypt’s Sinai Peninsula on November 1, 2015. These latest statements come shortly after the lead investigator had publicly said the plane seems to have broken up in mid-air while it was on autopilot. Still, he did warn there were other factors that could have caused the plane to break up, including a fuel explosion. That may help explain why there is still some doubt remaining among the investigators. UK Foreign Secretary Philip Hammond told the BBC on Sunday that if the plane crash that killed 224 people really was caused by a bomb, airport security must undergo extensive review, particularly in areas where the Islamic State is active. “That may mean additional costs, it may mean additional delays at airports as people check in,” Hammond said. Security at the airport in Sharm el-Sheikh, a popular tourist destination, was hardly in top shape anyway. Officials tell the Associated Press that the airport at the resort town had several gaping holes in security. In addition to hardware issues, such as a key baggage scanner that did not work, there was also the problem of police officers who were more than eager to take bribes. “I can’t tell you how many times I have caught a bag full of drugs or weapons that they have let through for 10 euros or whatever,” one official said.